KINSHASA, Gongo -- The United Nations peacekeeping chief today expressed his gratitude to Ukraine for providing tactical helicopters for the mission in the Democratic Republic of the Congo (DRC), saying the contribution will enhance the force's capacity to protect civilians. 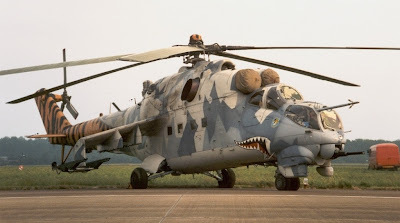 Hervé Ladsous, Under-Secretary-General for Peacekeeping Operations, was referring to Kiev's contribution of four Mi-24 attack helicopters to the UN Organization Stabilization Mission in DRC (MONUSCO). "As such, this critical contribution can make a difference in the lives of people in the affected communities," he said, adding that he cannot "overstate the importance of Ukraine's contribution." He noted that MONUSCO is one of the UN's most challenging peacekeeping missions, and that the recent shortage of military helicopters had made its work more difficult. Secretary-General Ban Ki-moon and the Security Council had repeatedly urged Member States to provide "force enablers," particularly military helicopters, to help protect civilians affected by conflict in DRC, Mr. Ladsous recalled. "I am very grateful that Ukraine has generously answered those calls. This is consistent with Ukraine's longstanding and invaluable support for UN peacekeeping. I am glad to say that the four helicopters are now in the DRC, and based in the east of the country," he added. Ukraine has also sent a contingent of military personnel to serve in MONUSCO, according to the mission. The UN intensified efforts to secure tactical helicopters for MONUSCO after India expressed its desire to withdraw its own choppers from the mission.